India and the United States have agreed a defence pact which will boost the sale of sophisticated American weaponry to Delhi. The US Secretary of State, Hillary Clinton, on a visit to India, said the two sides had agreed an "end-use monitoring" accord. This aims to help the US ensure that its military technology is not transferred to other countries. Mrs Clinton also held talks with Indian Prime Minister Manmohan Singh. 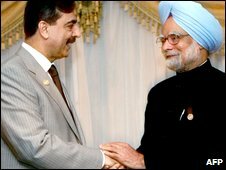 During Monday's meeting, Mr Singh accepted an invitation from Mrs Clinton to visit the US in November, officials said. 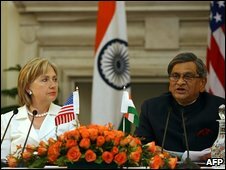 The end-use monitoring agreement was announced in a joint news conference between Mrs Clinton and the Indian Foreign Minister SM Krishna. End-use agreements are required under US law for weapons sales. India is seeking to buy fighter aircraft and nuclear reactors - deals that are expected to generate multi-billion dollar contracts, for which several US companies are bidding. 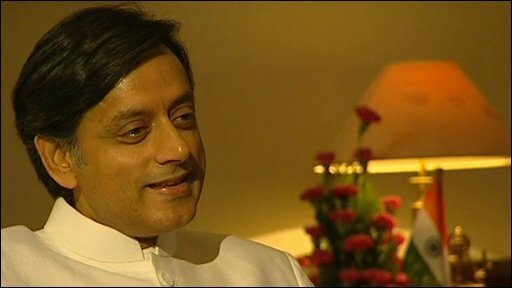 India also announced on Monday that it had approved sites where American companies will build two nuclear power plants. It is part of a civilian nuclear deal signed by the US and India last year. Mrs Clinton is spending three full days in India. She departs on Tuesday. Correspondents say Mrs Clinton's visit aims to show the US is committed to broadening its ties with Delhi. Addressing students at Delhi University ahead of the talks, Mrs Clinton said the US wanted to "deepen our strategic understanding" with India and find more common ground. Mrs Clinton also held talks with the leader of the opposition, Lal Krishna Advani. India's relations with neighbouring Pakistan were also expected to feature prominently in discussions. 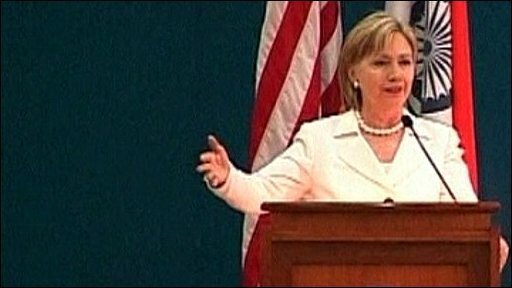 Our correspondent says that publicly Mrs Clinton has insisted that what Pakistan and India do is completely up to them. But he says everyone in Delhi is clear it was pressure from Washington that pushed the countries to hold talks in Egypt last week. Pakistan-India relations dominated Mrs Clinton's visit to Mumbai on Saturday, in the wake of attacks on the city last November that left more than 170 people dead. Clinton: "I have seen a real commitment on the part of Pakistan"
On Sunday, talks in Delhi focused on climate change, which remains a sensitive subject for developing countries such as India and China, which have so far refused to commit to carbon emissions cuts in a new treaty. Mrs Clinton also sought to assure India the US would not try to impose conditions that might affect India's economic growth. But Indian Environment Minister Jairam Ramesh said his government could not accept targets that would limit economic growth. India argues the US must do more as it has been historically to blame for the emissions. Mrs Clinton later told reporters she was optimistic a deal on climate change could be reached. The key date for climate change is December - when a summit in Copenhagen will look to forge a new international treaty that will replace the Kyoto Protocol, which expires in 2012. Are you in India? What do you hope Hillary Clinton's visit will achieve? Send us your comments using the form below.